There are two types of braking systems available for automobiles. One system uses brake pads and brake discs while the other system uses brake shoes and brake drums. The components of each system are really the equivalent of each other. Brake pads create friction against the brake discs and brake shoes create friction against the brake drums. When either one of these actions takes place, it causes the vehicle to slow down. A drum braking system uses a cylindrical component called brake drums. As the vehicle movies, the brake drums rotate. When you step on the brake pedal, the brake shoes make contact with the rotating brake drums. This results in the vehicle slowing down. On the other hand, if the vehicle featured a disc braking system, pressing the brake pedal would cause brake pads to rub against rotating brake discs. The result would be the same. Your vehicle won’t have both types of braking systems. It will either have one or the other. Most people don’t really check which braking system their vehicle has before they purchase it. After all, brakes are brakes, right? As long as they slow down the vehicle, who cares which braking system it is? Well, it might be a good idea for you to learn about the pros and cons of brake pads and brake shoes. That way, you have a better idea of the advantages and disadvantages of each system. This might influence which car you buy in the future. The disc braking system is used in most new cars, trucks, and SUVs. If it is a front-wheel drive vehicle, then brake pads and discs are installed on the front wheels. This area accumulates a lot of heat, which means the brake pads are designed to resist hot temperatures. Ceramic brake pads, in particular, are more heat resistant than metallic brake pads. Remember that brake pads are pressed against the spinning brake discs. As the brake pads slow down the rotation of the discs, the vehicle slows down along with it. Because of their heat resistance, brake pads have more longevity than brake shoes. This means you won’t need to replace your brake pads for a much longer time, saving you money. On top of that, brake pads cause more friction in comparison to brake shoes. More friction means that it slows down the vehicle faster. Now you can see why so many car manufacturers choose to use the disc braking system. They want their customers to be safe behind the wheel. Brake pads are not all made the same. Since there are 4 different types of brake pads, certain variations work better with certain vehicles. You also need to consider the way you drive and brake your vehicle too because you’ll want brakes which support your driving habits. A lot of people are not familiar with which brakes are better for their needs. And if a customer asks an auto salesman or dealer about this, they’ll likely be told a lie. So that leaves the customer responsible for researching and learning about brake pads on their own. The quality and superiority of brake pads mean they are more expensive than brake shoes. If you ever need to replace your brake pads, you can expect to pay a few hundred dollars more in expenses. Brake shoes are more affordable than brake pads. A lot of car manufacturers who sell smaller trucks or cars that are less expensive will install a drum braking system in them. Brake shoes are actually created from recycled materials. In fact, brake shoes can be recycled as well. 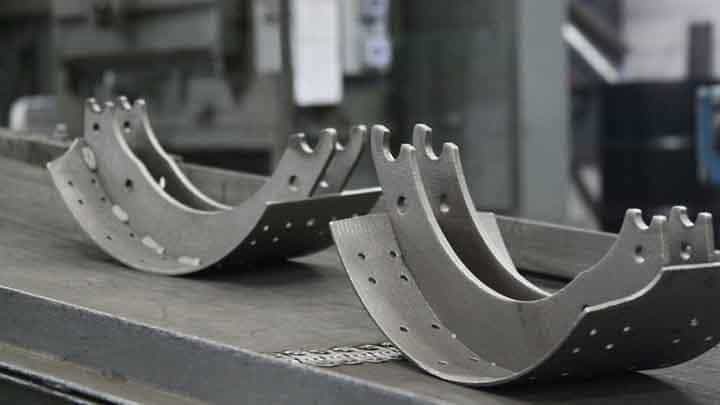 Mechanics may even make new brake shoes out of older brake shoes through the recycling process. That is why the costs are kept so low for brake shoes. As for heat resistance, brake shoes are usually placed in the rear of a vehicle. This is an area which doesn’t get hot, so there is no heat threat to the brake shoes. Brake shoes are not as heat resistant as brake pads. Some car manufacturers will still put the brake shoes on the front axles of the vehicle where more heat is generated. This will wear down your brake shoes at a fast rate and force you to replace them more frequently. So, even though they are cheaper to purchase, you will be purchasing them more than you would brake pads. Therefore, the affordability factor doesn’t really matter in this case. The best thing to do is listen to your vehicle manufacturer and use the braking system which they recommend. Some people try to replace the factory braking system in their vehicles, but this is not a good idea. Cars are made to accommodate the braking system they came with. If you attempt to switch systems, it could potentially cause severe problems with your brakes and your ability to drive safely. When you research vehicles to purchase, make sure you consider which type of braking system is more important to you. Would you rather have an affordable system which uses brake shoes and drums or a higher quality and expensive braking system which uses brake discs and pads? Once you make your choice based on your budget and quality needs, go out and purchase the vehicle which has that particular braking system in it. That way, when you need to replace its brake pads or brake shoes, you won’t be surprised by the frequency and expense of the replacements.